As dealers in fine stringed instruments, we have many violins, violas and cellos come through our shop from a number of different German, French, American, English, & Italian makers. Our inventory is constantly in transition as instruments and bows are bought, traded and sold. A small selection of our large inventory of antique and collectible Violin, Viola, Cello & Bass. Please click the images below to explore our instruments. Our Mission: We provide the highest quality service for our inventory of carefully selected instruments and bows – at honest prices. Our goal is to share our knowledge, and experience by being a one-stop shop for all your musical needs. We provide for customers of all levels – ranging from the busy professional, dedicated student, local school orchestra programs, college students, institutions, and everyone in between. Family Owned: We are a family owned and operated business with deep roots in the community, with a sincere appreciation for our customers and their needs. 2018 marks our 12th year in our current location and we intend to continue the high level of service you have come to expect for years to come. Visit our Website: for more information please check our website at www.wyattviolin.com and our Facebook page at facebook.com/wyattviolinshop. We accept appointments which can easily be made by calling us at 816-252-5656 or by completing the appointment request form on our website. Trade in value: We take pride in our products and always allow the highest trade in when customers need to step-up to higher-end instruments. We have the highest quality instruments at all levels to fit the playing needs and price point of all customers. In-House Zero Percent Financing: For most purchase situations we offer Zero Percent Financing making our instruments even more affordable. Our Staff: Our staff includes professional musicians & educators who can sort through our extensive inventory to help you with your search. We can offer insight into options that make the most sense for your budget and help you find a combination of instrument, case and bow that suits your needs. We have trial rooms available (by appointment) for customers and welcome teachers to accompany the student. We also encourage customers to “trial” the instrument to obtain teacher approval. Large Select Inventory: Our inventory includes a selection from student level to professional quality, new and antique instruments, at all price ranges. 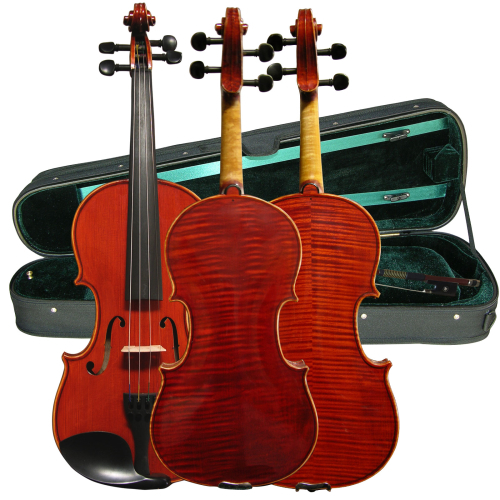 We can show you instruments that fit your needs and help narrow the search to fit your budget. We want you to be confident in your selection – after all, it is the beginning of what we hope will be a lifelong relationship with the Wyatt Violin Shop!